Right, then, first things first, Try to Remain Calm! We’ve got something exciting this Saturday evening as we’ve just sent us over some rather nice casting news along with a rather fabulous first poster and synopsis for a new movie, UFO. The film comes from the came team behind How to Stop Being a Loser (trailer here) and Airborne (trailer here) which is currently in post production and stars Mark Hamill (All our coverage here). UFO is currently shooting in Derbyshire in the UK and we’re told that it’s a mix between Independence Day and Monsters told from the point of view of Signs! Sounds intriguing! The film’s principle lead is American actress, Bianca Bree and this will be her first major movie. From what we’ve heard she’s one to watch out for as we have it on good authority that she’s going to be rather a big star in the making. She’ll be joined by Sean Brosnan who has a rather famous dad in the form of Pierce Brosnan, Simon Phillips who we’ve previously seen in the ‘Jack’ series of movies, Andrew Shim who you’ll know from This is England and more recently Airborne, Jazz Lintott (Airborne/The new recruit on The Real Hustle), Peter Barratt (Jack Falls/Airborne), Forbes KB (Jack Falls/Airborne) and another newcomer Maya Grant who won her role after an extensive casting call. Last and by no means least we have a cameo from the legendary Jean Claude Van Damme! This is the casting for now. We’re told that there are more names to be announced but this should get you excited. We’ll obviously bring you any more developments as we hear them. 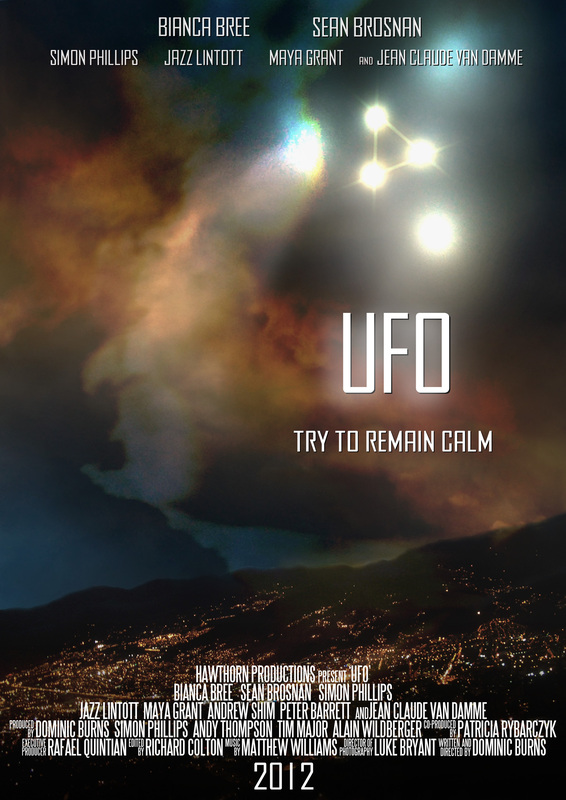 The script comes from Dominic Burns (How to Stop Being a Loser, Airborne,) who is also directing UFO. Andy Thompson, Tim Major, Dominic Burns and Alain Wildberger act as Producers. Scroll down to have a read of the synopsis and scroll down even further to see the brand new and exclusive poster from the movie which we’re very excited about! We hope to see the movie on screen in 2012. Synopsis: Five friends wake on a seemingly normal morning to find the power’s out, there’s no mobile phone reception and the radio can tune nothing but static… None of the neighbours know anything about what could have caused these occurrences and news soon arrives that it may in fact spread across half of the UK, maybe further. But with no way of discovering any information and no advice on what to do, the atmosphere quickly turns edgy. Two nights later they are awoken in the dead of night by what seems like a violent earthquake, strange lights are spotted shining down from high above outside, something is flying over the house, not just the house, the entire neighbourhood, something huge. A city size UFO, finally settles, hovering in the distance above the nearest city. What now? Are they going to attack? Have they already attacked? Are the power cuts an accidental side effect the UFO isn’t aware of? How quickly will society deteriorate and turn into survival of the fittest? What would you do to survive, to ensure the survival of those you love? Whatever happens… Try to remain calm. Click the poster below to enlarge. Previous articleMike Myers Back For Austin Powers 4 – Throw Me a Frickin’ Bone Here!